The Jets took the early lead on the strength of two passing touchdowns from QB Josh McCown, one each to TE Austin Seferian-Jenkins and WR Jeremy Kerley. The Patriots would fight back though, with two second-quarter scores, a rushing touchdown by HB Dion Lewis and a QB Tom Brady to TE Rob Gronkowski touchdown pass, to tie the game at halftime. Brady to Gronkowski would be good for another touchdown in the second half, and the Patriots also added an insurance field goal. With the Jets only second half points being a field goal of their own, the Patriots would win 24-17. With that, we give you our PFF exclusive takeaways from the contest for each team. Averaging an impressive 2.86 yards per route run, Gronkowski didn’t look to be even slightly slowed by the injury that kept him out last week. Finding the end zone twice, he was Tom Brady’s favorite target, with 10 passes heading his way over the course of the game. The only slight knock on his performance was a drop on a pass thrown slightly behind him in the end zone, but he made up for it with a touchdown catch on the very next play. Even though Butler allowed 114 receiving yards, gave up a touchdown pass and surrendered another reception for a big gain on a coverage bust, he had one of his best games this season. 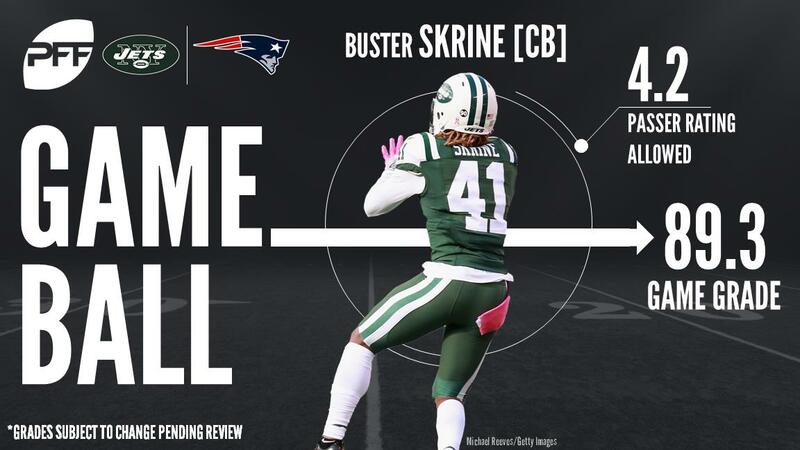 Butler was the Patriots’ most frequently targeted defender as there were 10 passes going his way; however, only four of those were completed as he also broke up two passes and recorded an interception. As a result, Josh McCown had a passer rating of 76.7 when going after Butler as he allowed just two receptions on eight targets to Robby Anderson. While Brown was on the field for only 44 of the Patriots defense’s 75 snaps, he had a large impact on the game, especially when it came to run defense. Brown recorded two run stops on just 16 snaps against the run and was a problem for Jets offensive linemen all day long. Furthermore, the former Texas player also recorded two pressures, including a sack on 28 pass rushing snaps. Seferian-Jenkins stepped up as a safety blanket for quarterback Josh McCown as he was the Jets’ second-most-targeted player with 10 targets and was tied with RB Matt Forte for the most receptions with eight. Furthermore, the former Tampa Bay Buccaneer beat five different New England defenders for a reception as McCown had a passer rating of 119.2 when targeting the tight end. McCown had a mixed outing against the Patriots as had some successful drives and a couple ill-advised throws as well. Overall, he had relatively good results throwing the ball downfield as he completed 8 of his 16 attempts traveling 10 or more yards from the line of scrimmage, including two touchdowns. In addition, McCown played well under pressure and completed 9 of his 14 attempts under pressure and had a passer rating of 91.4 in these situations, which is higher than his passer rating of 84.6 when kept clean.